It’s been so much fun watching all the games here (and I mean “all” because I think I have seen them all – when in Europe, right?). It’s a great atmosphere though – almost every restaurant sets up a TV either inside or outside on the patio and sure enough, a few minutes before game-time, the seats fill up and people anxiously start watching the game…waiting for a precious goal..or ready to throw up their hands against an unfair foul. 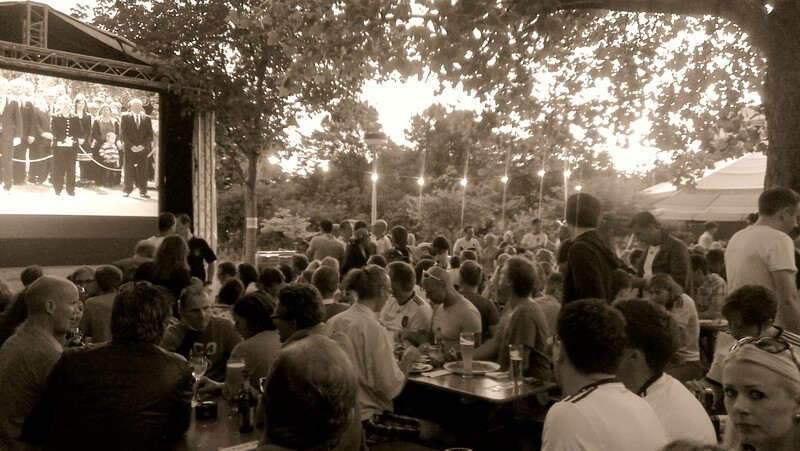 Not only is it an exciting game to watch, it’s been a great way to meet new people in Berlin. Last Saturday night, we shared our table with a Danish couple visiting Berlin who wanted to watch the Spain vs. France game. Sure enough we started chatting about the game and as the game ended and into the wee hours of the night, we were still chatting about all sorts of things: Berlin, Copenhagen, religion, the Mohammed drawings, shopping, clubs, immigration blunders, restaurants, the geography of Montana, etc. I’ll definitely miss the games when they are over. We’ve got a couple more games to watch before this European Championship comes to an end…and I sure hope that Germany wins so that I can bring you another video like this one.